The Video Player Generator is one of the many Graphics Tools offered by eCover Go, and is a useful tool that enables you to create a Flash Video Player for all your promotional videos. In the Video Player Generator, clear steps are outlined to help you create your desired video player for FLV video files. For instance, the Video Player Generator allows you to choose from several different video player themes, so that your selection can better match with your existing website design. Also, the tool conveniently offers you the option to add a customized link to your homepage, thereby integrating into your overall website design. As the Video Player Generator is a Web-based software, there is no need to download or install the software on your local computer. All you need is simply a browser with installed Flash Player Plugin and an internet connection. 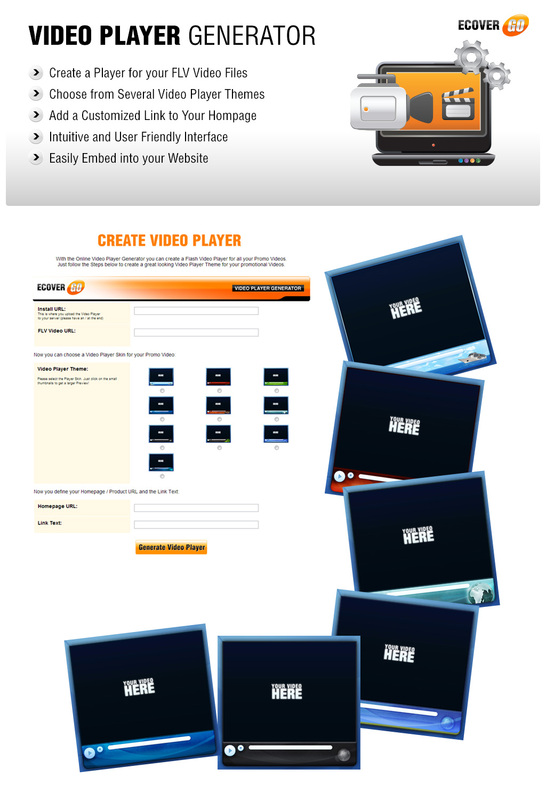 With the Video Player Generator, you can easily create a customized player for your promotional video files.